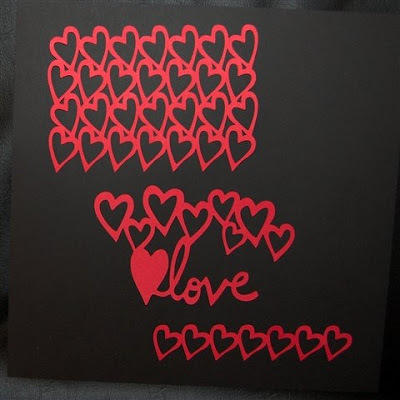 While I was experimenting with my "new" Paper Pups cartridge I made a variety of card topper designs - very simple but fun for Valentine's Day coming up. I thought that this would be a quick blog entry today since I did all of them in the same file as the "Love, Love, Love" title from yesterday's post. However, I decided that it would be a good idea to divide them into two separate files for A2 and 5 x 7 cards and to move the designs to the top half of the mat so they could be cut by baby bug owners. All of this took a bit of time, but I think it will make it easier for you. If you have an Expression, and don't want to wear out the top of your mat too fast, remember that you can flip the mat around and load it with the arrow facing toward you instead of the machine to balance the wear and tear. Here are all the variations for the A2 cards. 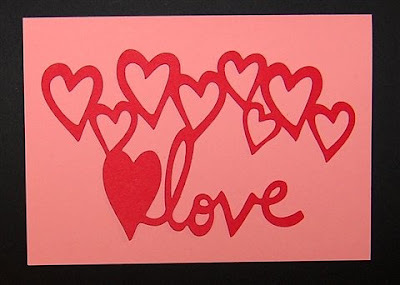 The three row open heart mesh and the three row love in a heart mesh are not adjustable but were sized to fit the card comfortably. Above is the three row open heart mesh - some of the hearts are flipped so it is not possible to do this as an adjustable file. 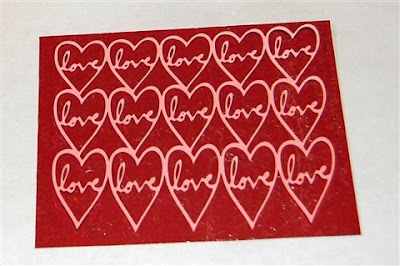 Above is the mesh of "love in a heart" in graduated sizes. 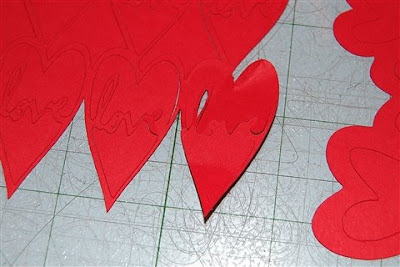 This is very delicate but did cut cleanly, just take your time as you remove it from the mat. I decided to have some fun with glitter and this design. 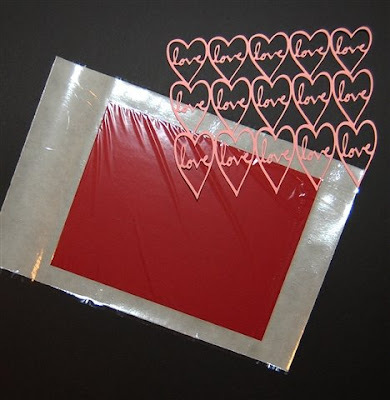 First I ran a piece of 5.5 x 4.25 inch red cardstock through my Xyron. Then I gently placed the mesh on the adhesive. I have had my Xyron a long time and I think my refill cartridge has deteriorated a bit - the adhesive is not perfectly even (it is a bit hard to see but remember you can click on the photo to enlarge it for a better look). 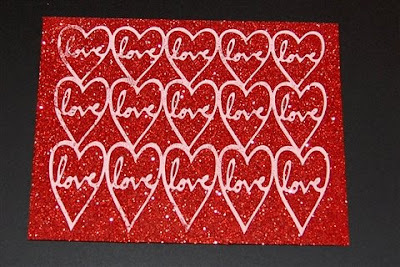 I poured Martha Stewart glitter all over the card front - a big sparkly mess! 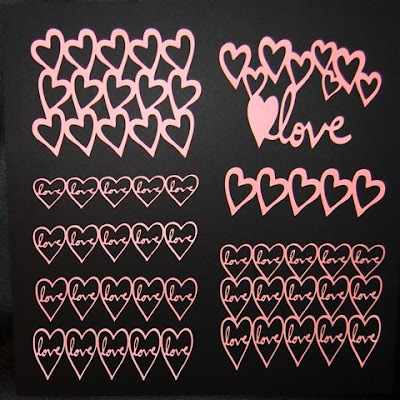 It is a good idea to use cardstock in a color close to the glitter in case the coverage is not perfect - having the same color in the background will help to camouflage any missed spots. 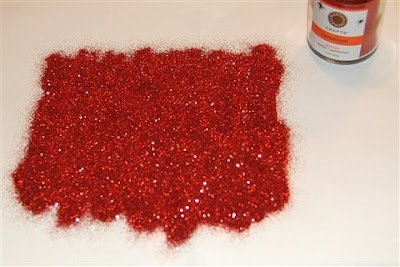 Here is the card topper after some shaking to get off all of the excess glitter. I didn't get the mesh stuck down perfectly the first time, so I went back and added a bit of glue here and there to try to get it stuck down and then I reglittered. I am not so sure if I like this but it was worth a try! Above and below you can see the various cuts for 5 x 7 cards (they would not all fit on a single 12 x 12 page to photograph). 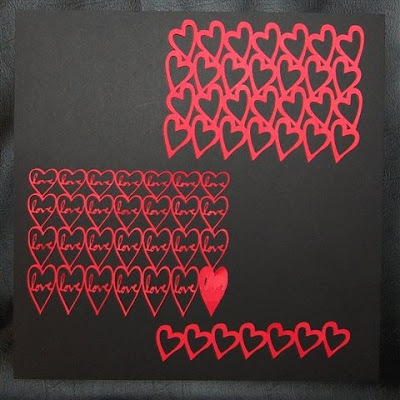 I did not actually cut the separate rows of "love in a heart" but they are in the file for you. 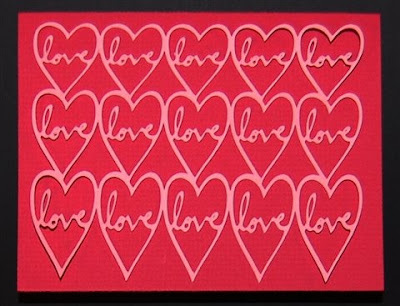 The design with the large "love" is adjustable and is sized to fit the 5 x 7 card nicely in the file. 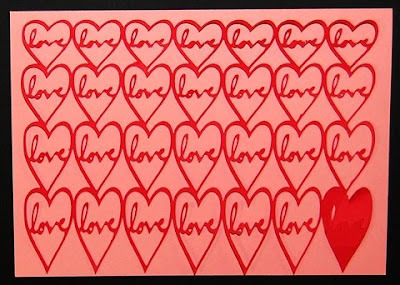 Below is the open heart mesh - for the 5 x 7 size I used four rows of seven hearts. 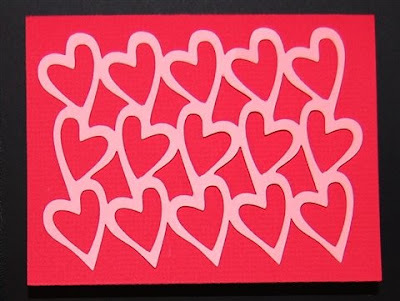 Once again, I could not make this adjustable because some of the hearts are flipped. 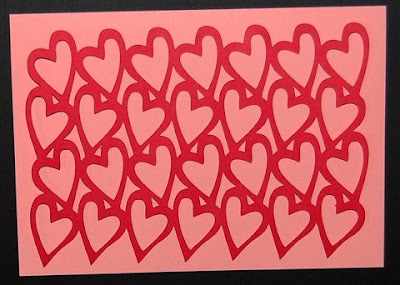 For the delicate "love in a heart" mesh (which is also expanded to four rows and seven hearts across) the cut was successful until the very last heart! Here you can see it on the mat. The paper must have lifted a bit and the cut did not completely finish. 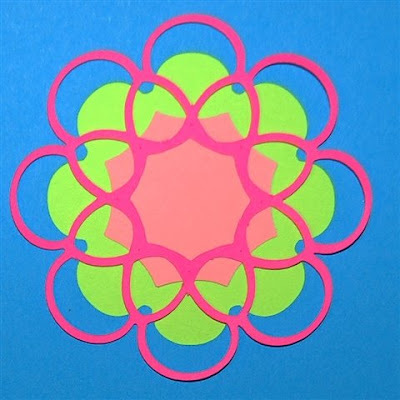 This is also not adjustable but sized for a 5 x 7 card. 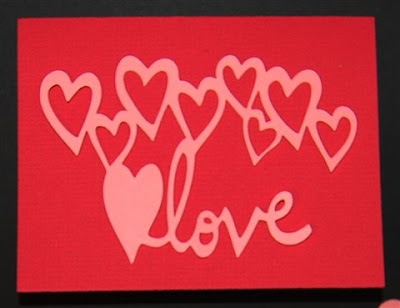 Here you can see the cut on a card - I think it is one of those "happy accidents" and I like the idea of having a solid heart in the corner. I will cut one and layer it on top of the cut to "rescue" this card. Have fun with these - tomorrow I will be posting the newest medallions which combine with some of the files I have already shared for some very interesting effects! Here is another sneak peek! Thanks again! These are darling designs. Love what you did with your card...and another toy I just have to have.... :) Thanks again. Take care. Thanks for sharing all the LOVE! I really like the card designs. Thank you for sharing. I just LOVE all the LOVE designs! And I happen to LOVE PP, so I am glad you have found your passion for it, as well! Something a little different - Happy 50th! Thanks to all who joined the celebration! Catching Up - Awards and Thanks!